BEDFORD, Mass. — Robot vacuums have now been around long enough that you might watch one bump around a living room and think, why isn't there a robot that could mow my lawn? Turns out, it's not for lack of trying. 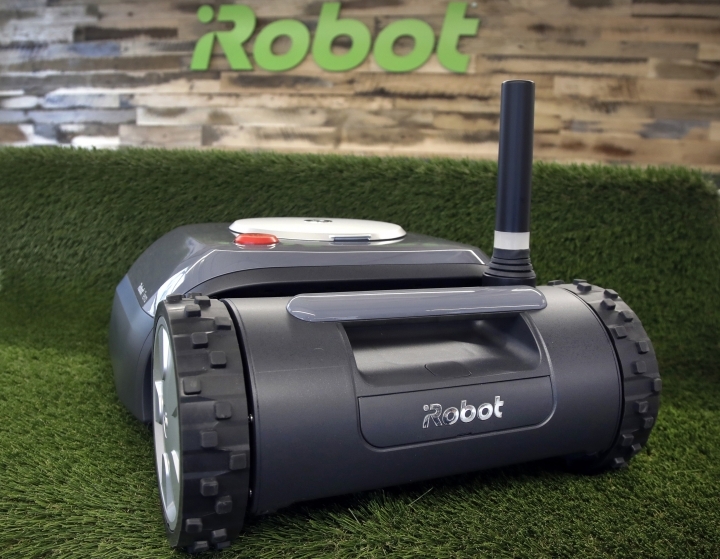 For more than a decade, iRobot, the company behind the Roomba vacuumbot, has been working — and working — on robotic lawn mowers. Now it finally has something to show for the effort, though it's come at a cost. 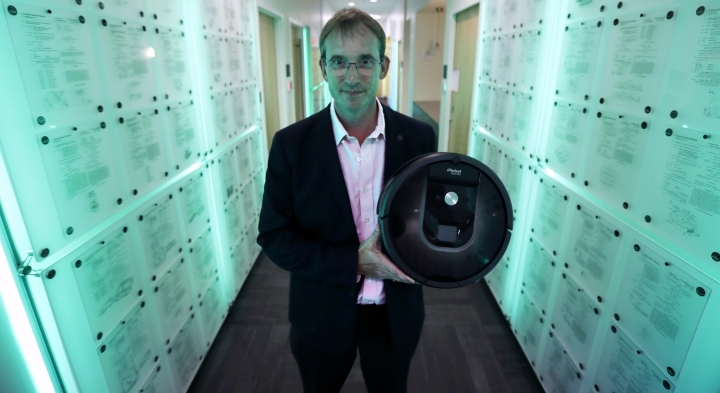 "Honestly, this robot drove me insane," said iRobot CEO Colin Angle after showing off Terra, the company's long-awaited first lawn mower. "It has been an obsession." The flat square autonomous grass-cutter that Angle's company unveiled Wednesday resulted from a protracted engineering struggle that included dead-end experiments and a conflict with radio astronomers. Angle and his colleagues have been fielding the question, "So, when are you going to mow my lawn?" since the company starting selling Roombas in 2002. But teaching a robot to navigate a typical American yard without destroying its flowerbeds was harder than it first seemed. "There was a lot of despair and frustration on the journey," Angle said. Engineers threw every technology and mechanical design they could at the secret project, which they hid behind tall, opaque fences abutting a freeway just outside iRobot's Massachusetts headquarters. The test lawn included a picnic table and other obstacles. The first problem was helping the robot identify its location so it wouldn't get lost and miss spots. Satellite-based GPS technology didn't do the trick; it was too "finicky" because interference from tree branches or nearby houses could render it useless, Angle said. Also ineffective was the sophisticated computer vision that powers the latest Roombas. The technology didn't work well outside because camera lenses can get blocked by leaves or dirt, and its machine-learning algorithms get confused as the mower bumps up and down. Laser range-finders and ground-based beacons presented different challenges. The company made so many attempts that several early lawnbot prototypes can be spotted in the 2008 heist film "21." They make their appearance in a scene where Angle plays a professor at the Massachusetts Institute of Technology announcing the winner of a robotics competition. The current Terra looks nothing like those prototypes. "We had given up," Angle said of the project. "We probably gave up twice." 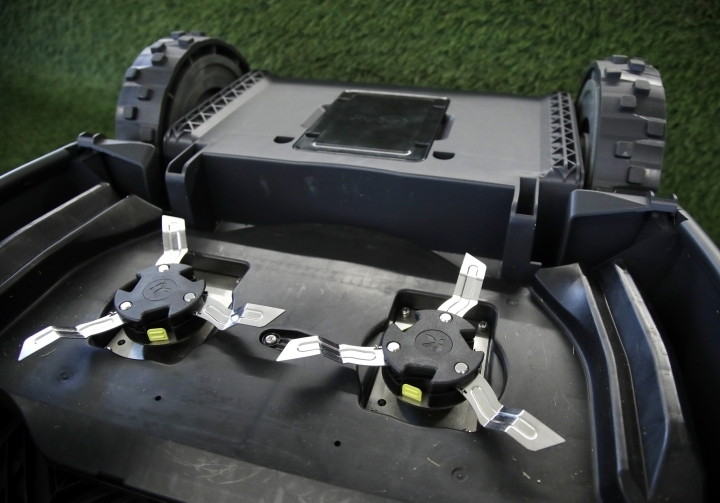 Robotic lawn mowers also started to proliferate in Europe, where they're now a roughly $300 million industry. Those robo-mowers, however, require homeowners to set up a perimeter of boundary wires to keep the machines in a confined area. Angle said that works well in Germany, where backyards are typically small, flat and rectangular, but not in the meandering lawns of the United States. American lawn culture also sets a higher bar for what a cut should look like: straight, back-and-forth lines are prized, he said. 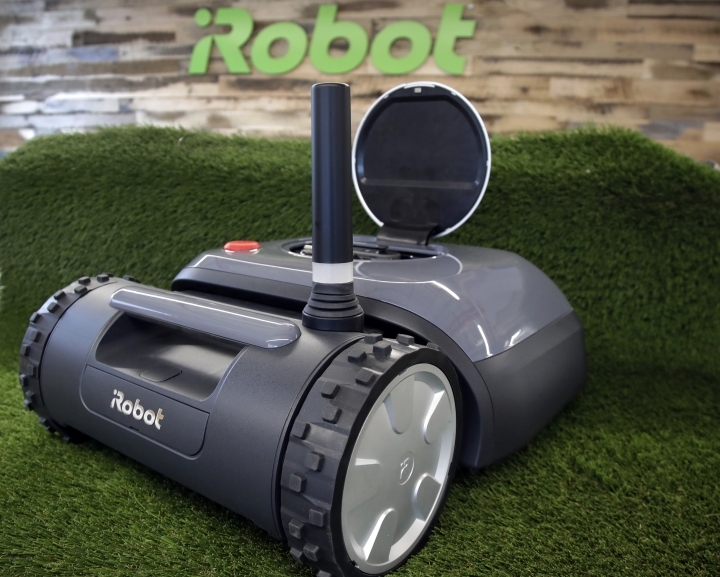 The company finally found its answer in a radio technology based on "ultra-wide" bandwidths that would guide the mowers with the help of beacons situated around the lawn, combined with the map-making memory that iRobot already uses for its vacuums. But that idea ran afoul of astronomers who said the radio signals could interfere with their studies of interstellar chemistry. IRobot eventually won permission from the Federal Communication Commission to use ultra-wide bandwidth for wireless robotic lawn mowers — though not before Harvey Liszt, spectrum manager for the National Radio Astronomy Observatory, argued to the FCC that "there is already a competitive market for robotic lawn mowers using wire loops, which has somehow failed to stanch the stream of ghastly accidents and spilt gasoline that iRobot associates with the mundane practice of lawn-mowing." 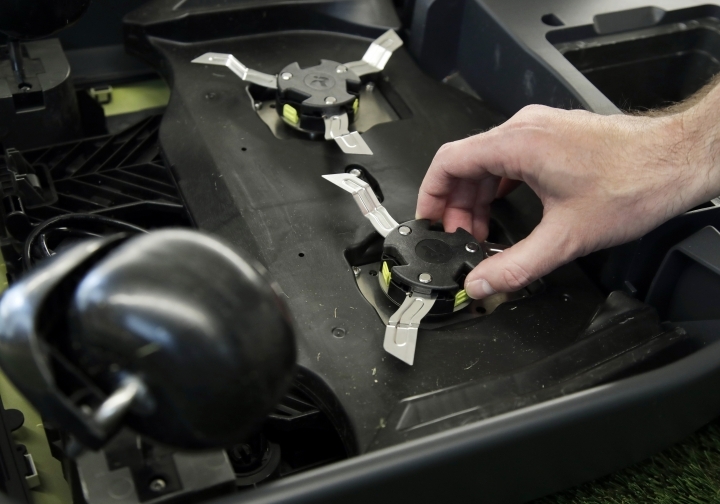 The quiet, electric-power mower sports a pair of tri-blade mulchers that are meant to work slowly on a lawn — instead of the typical once-a-week cut with a push mower, it can maneuver around a lawn daily or a few times a week — and returns to its station when complete. Users can schedule the machine with a phone app; if it runs down on juice while moving, it will return to its dock to recharge, then resume where it left off. Along with the radio technology, it has a variety of other sensors to avoid tin cans and other unexpected debris. 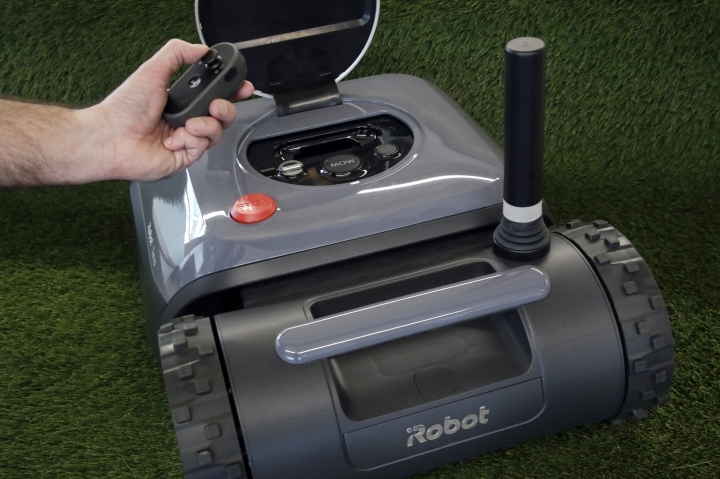 The robot will first launch in Germany, where iRobot hopes to capitalize on an existing market where perimeter-based models made by Husqvarna, Bosch and other firms are already popular. 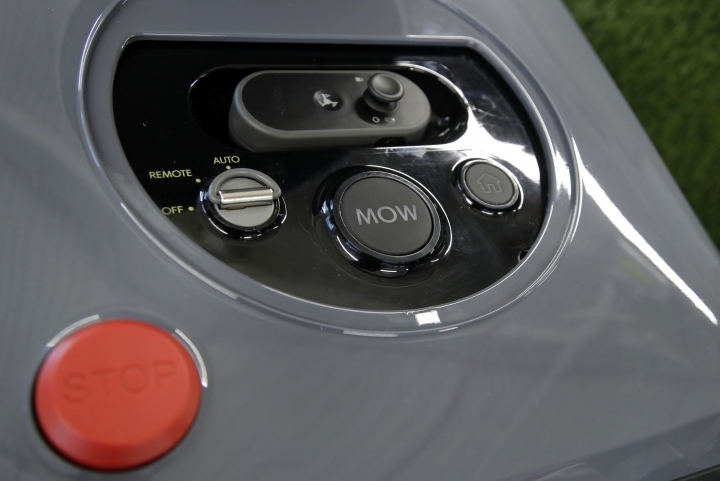 The mowers will go on sale in the U.S. in 2020 after an invite-only beta launch later this year. Forrester consumer technology analyst Frank Gillett said iRobot seems to have solved some of the technical difficulties of autonomously mowing to U.S. lawn culture standards, but he remains skeptical that there's enough demand among American homeowners, many of whom are either proud of their push-mowing work or willing to pay someone else to do it. "The bigger issue is still the cost," Gillett said. The company hasn't yet disclosed Terra's likely price, but existing high-end robotic mowers can run well over $1,000.